Statue of Jacques Marquette on Mackinac Island, 2007. 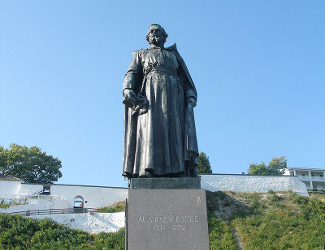 Statue sits below the parapets of Fort Mackinac. Courtesy Wikipedia Commons. Over 1 million visitors per year. 3.8 square miles. Approximately 2,400 acres. Free with ferry access. Other sites on Mackinac Island may require an additional fee. Mackinac Family Heritage Pass - Allows access to six historic sites on Mackinac Island and in Mackinaw City for $85, including two adults and all children. Fort Mackinac (separate) - $7.75 (children) to $13.50 (adults). Discounts for buying online. For most visitors, and not the four hundred plus residents, a visit to Mackinac Island will be during the spring, summer, or early fall. The island gets thirty-nine inches of rain per year, plus ninety-three inches of snow. In summer, temperatures average Upper Midwest cool, with lows in the 50's and highs ranging, most days, in the upper 60's and low 70's. Dress appropriately and pay attention to the local weather forecasts. You are surrounded by a Great Lake, so beware of changing weather conditions, on land, and especially on the water. 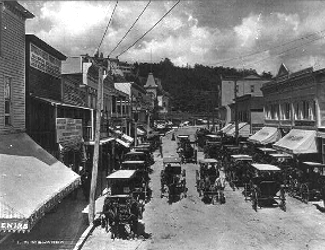 Photo above: Horse drawn carriages on Main Street, circa 1890-1910. Courtesy Library of Congress. 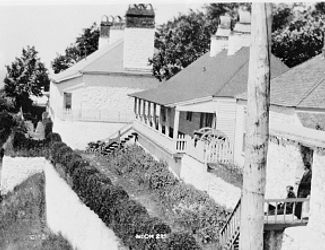 Right: Old Block House of Fort Mackinac and the Mackinac Island Harbor, 1899, Detroit Publishing Company. Courtesy Library of Congress. It's a midwest pleasure island that harkens back to Victorian days where cars are unwanted and horse drawn carriages take you from place to place. Mackinac Island draws over one million vacationers to this past is present place for a summer week, pleasure walks, and history at Fort Mackinac and other abodes. One interesting note for the national park fan, at one time the second oldest national park existed here, 1875, right after Yellowstone, Mackinac National Park, but the federal government gave it back to the state in 1895. So it's now a state park. For those that get the chance to tour upper Michigan some summer, a visit to Mackinac Island is like no other. Plenty of places to walk (you almost have to) and sites to see. Take a break from the hustle and bustle and plant yourself on the island one year; you'll wonder what took you so long. Prior to European settlement in the 17th century, the island was home to Ottawa traders from a small indepedent tribe known as the Mi-shi-ne-macki naw-go. The first recorded account of French trappers date their arrival in 1654; there is also speculation that others may have arrived twenty years before. In 1671, missionary and explorer Jacques Marquette arrived, taking over for predecessor Claude Dablon, who had been there the year prior. 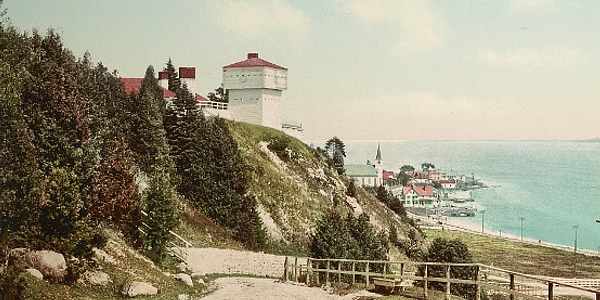 A century later, the island was inhabited by the British, who built Fort Mackinac in 1780 to enhance their military presence, which had been fortified in Mackinaw City at Fort Michilimackinac prior to the American Revolution, but now vulnerable to an American attack. When the revolution was over, the new United States were now in technical possession, although British forces did not leave the fort until September 1, 1796. But even that U.S. possession would not last. In the War of 1812, the first land engagement saw British forces take Fort Mackinac on July 17, 1812. 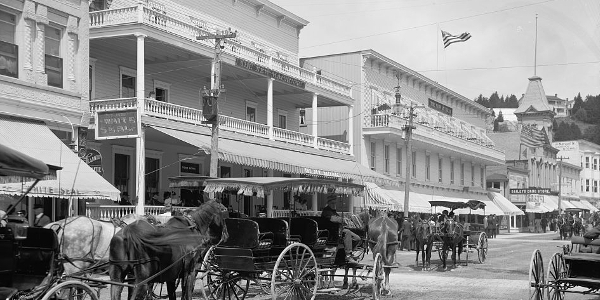 Photo above: Mackinac and Murray hotels in downtown Mackinac Island, 1908, Detroit Publishing Company. Courtesy Library of Congress. Below: Main street of Mackinac Island today, 2014. Courtesy Wikipedia Commons. Now at Mackinac can seem like then, as much as possible in today's world. No cars. Five hundred horses that take you on carriage rides from place to place on the island. And so many bicycles in the summer that you might think you're in Europe or Japan. The past is Mackinac Island's present. Quaint places to stay. Historic sites to visit. The beauty and nature of northern Michigan, the Great Lakes, and as much peace and quiet as you can imagine in a tourist town. 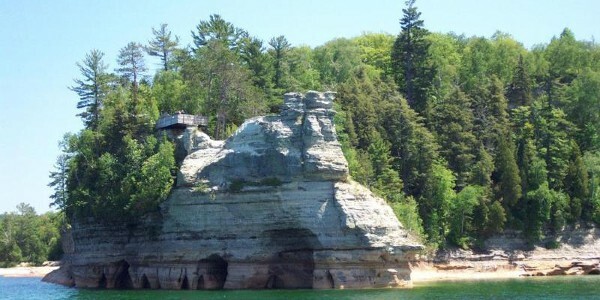 There are six Michigan State Historic Park sites between the island and Mackinaw City, where you'll likely depart. From Colonial MichiliMackinac, Fort Mackinac (part of Mackinac Island State Park), Historic Mill Creek Discovery Park, Mackinac Art Museum, Old Mackinac Point Lighthouse, and Historic Downtown Mackinac, you'll get a history lesson about the Great Lakes, how it was defended, and what made it special. For many who visit, it will be the charming past of a different kind that wets your whistle. Walks along the lake, ice cream at a turn of the century themed parlor, and miniature golf, or regular golf, are a regular staple of a visit here. And there's very little hustle and bustle of the regular kind. No cars since 1898. Pretty cool. The island has a summer population of about fifteen thousand people per day. Transportation around the island is by bike (1,500 are available to rent), hike, or horse drawn carriage. The entire island has been a National Historic Landmark since 1960. Mackinac Island T-Shirts and Souvenirs. 1. Rent a bike and start to ride. There's so many unique places to visit on Mackinac Island, and no matter where you stay, a ride to the Grand Hotel is a treat. You'll think you went back over one hundred years at every turn. 2. Tour Fort Mackinac. Sitting on a bluff overlooking Lake Huron, you'll harken back to the War of 1812 when the British took back the island from the United States, partly because the American soldiers did not know we were at war yet. 3. Take a horse drawn carriage ride. 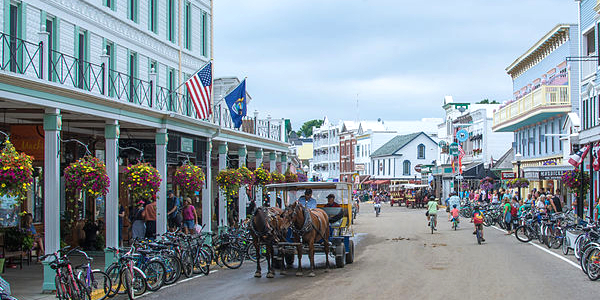 There are a variety of options, from a Carriage tour of Mackinac Island State Park to private carriages to various points of interest, either driven by others or even driven by you. And if you'd rather spend the day on the back of a horse instead of riding behind them, you can rent a horse for a ride at several livery stables. 4. Okay, you'll have to be somewhat rich for this one. Stay at the Grand Hotel and pretend you're from old money. 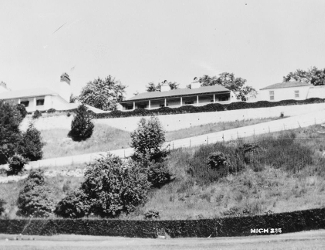 Photo above: Ramparts of Fort Mackinac, including the Guard House, Officer's Wood Quarters and Stone Quarters, 1936, Charles Norton, Jr., Historic American Buildings Survey. Courtesy Library of Congress. Once you reach Haldimand Bay by ferry, much of the attraction part of the island is right in front of you, including hotels, shops, and fun. For even better orientation, make your way to the Mackinac Island Visitor and Convention Center at 7274 Main Street. They'll help you get your bearings. Open 9 to 5 all days from May 1 to October 31. Weekdays in the winter. Mackinac Island State Park - The park covers eighty percent of the island and includes Fort Mackinac, which is close to the downtown area. The park also includes Fort Holmes, further inland, built by the British after they captured the island in 1812. Biddle House - Built in 1780 and restored to represent a wealthy fur trading family home in the 1820's. Other Museums - On a variety of topics from the American Fur Company Store, Carriage Museum, the McGulpin House, and the Mackinac Art Museum, which is housed in the Indian Dormitory of a school constructed to teach Native American students after the Treaty of Washington in 1836. Shop till you Victorian drop. Eat till you fudge out. Take a walking tour to find out your next favorite place to shop, or fudge, or mini-golf. Photo above: South ramparts of Fort Mackinac, 1936, Charles Norton, Jr., Historic American Buildings Survey. Courtesy Library of Congress. Mackinac Island is located in Lake Huron in the center of the northern part of the state, with access points off Interstate 75. It is reachable, however, only by private boat, ferry, or small aircraft. Most visitors reach the island by ferry from Mackinaw City (Lower Peninsula) and St. Ignace (Upper Peninsula). Some travel in winter over an ice bridge by snowmobile, but that probably won't be you. Two ferry services serve the island; Star Line Ferry and Shepler's Ferry. Star Line Ferry costs $25 adult round trip, $14.00 children (5-12), under 5 free. There is a $12 fee to bring your bike. Parking is extra. Shepler's Ferry pricing is similiar with some extra package perks and an $11 bike fee. These prices were 2019 and subject to change. There are benefits to buying online before you come. Private air charters service is available from Great Lakes Air and Fresh Air Aviation. 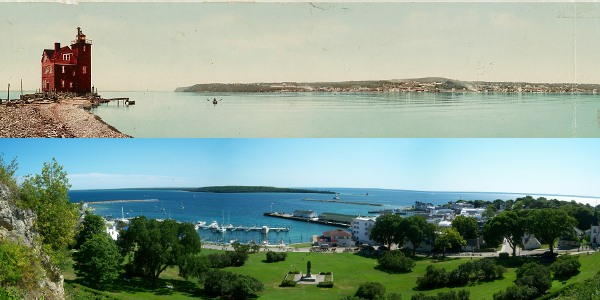 Photo above: Montage of (top) Mackinac Island from Round Island, 1899, Detroit Publishing Company and (bottom) Marquette Park from Fort Mackinac, 2010. Courtesy Library of Congress and Wikipedia Commons. Grand Hotel (1887) - Built by the Michigan Central Railroad, Grand Rapids and Indiana Railroad, and the Detroit Steamship and Navigation Company due to the limited accommodations on the island, it opened in 1887 with rates from $3 to $5 per night. They're higher now. Lots of famous guests over the years, from Mark Twain to Jimmy Durante to Robert DeNiro to Bill Clinton. Today's prices $345 and up, including all meals. Hotel Iroquois (1900, Inn since 1904) - Only forty-five rooms right along the water, it's not inexpensive either at $250 plus, but has been named the "Best Small Hotel in the World" by Conde-Nast. Murray Hotel (1882) - Right on the Main Street, this historic inn has sixty-nine rooms and is cheaper than those other two at $99 plus. You're in the middle of things here on Mackinac Island, so it's not quite as private a stay. Camping - No camping is allowed on the island. 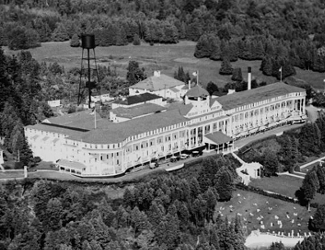 Photo above: Grand Hotel on Mackinac Island, Historic American Buildings Survey. Courtesy Library of Congress.